A new species found in India's eighth longest cave. India’s eighth longest cave in Meghalaya has revealed one of its closely guarded secrets. 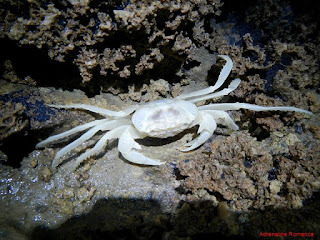 Researchers have stumbled up an almost blind, albino crab that had to date remained hidden in the darkest corners of the 7.3 km long cave. These are with small bodies measuring less than 2 cm. Having short and slender legs with hairs on them. They are perfectly adapted to cave-life and live in ‘dark zones’ under pitch black darkness, where temperatures remain almost constant. Because there is no light they have no colouring pigments and hence albino and blind. While this one has a large eye socket but a retina smaller than a poppy seed the former ones have smaller sockets.